Mecum are arguably one of the biggest auction companies that handle old and new muscle cars, along with many other types of vehicle in the world. 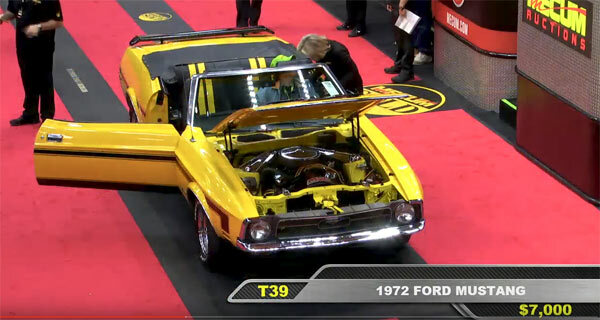 Their website is a great way to get the finer details on a particular muscle or pony car, but there’s nothing like seeing a live auction, which you can do via the aid of their YouTube channel. Obviously being there in the flesh is always going to the best for the full adrenaline rush and excitement, but having a live stream from the comfort of your home is not a bad second. These live streams go on for the duration of the auction, this one being nearly 4 hours long. Therefore, if you’re just interested in the pony and muscle cars, you’ll have to skip through the video intermittently, but it’s really best to have it on in the background while you’re doing something else waiting for the choice vehicles to come up. Just check out the video below and it will give you an insight into one of these great live auctions.